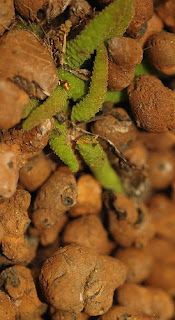 Just to piggyback on Brian's post below, at left is a photo of Eucodonia 'Adele' rhizomes. These were brought in to one of our meetings by Jim Roberts, who did a presentation on growing gesneriads in LECA (expanded clay aggregate). LECA is a hydroponic medium, and can be used to grow plants "semi-hydroponically" - i.e., with an inch or two of water in the bottom. For more on growing in LECA, see Jim's article in the August 2008 issue of the Petal Tones newsletter (newsletter archive here, and here's a direct link to August 2008 PDF). Of course, fall is not exactly the best time of year to repot most plants into a new medium - that's best done when the plants are actively growing. If you want to try it now, pick a plant that keeps growing through the winter.